Descansos mark the moment when an intended journey took an unintended detour. They draw the gaze to a stranger’s last vista—to feel the very end, and sometimes even what comes after. 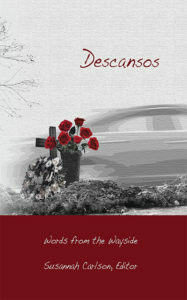 Descansos is an anthology of poetry, flash fiction, essays, and short stories that pull over by the roadside and gaze into the distance through the eyes of dead strangers and the hearts of those who remember them. Only $11.95 in paperback! Only $2.99 for eBook!